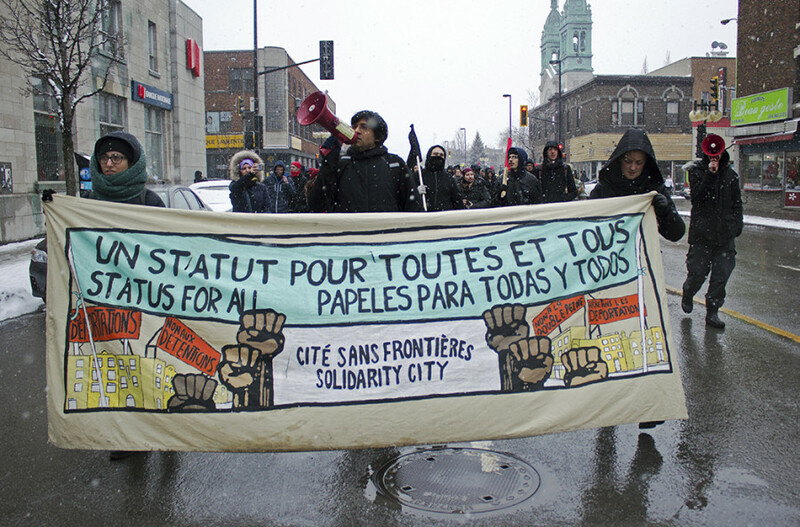 Around 150 people gathered outside of Jarry metro station on Saturday afternoon to stage a counter-protest against PEGIDA Québec, the right-wing political group calling for more restrictive government immigration policies, especially in regards to Muslims. The Quebec branch of the group was set to demonstrate in front of Jarry metro in solidarity with concurrent PEGIDA protests in parts of Europe including Dresden, Calais and Prague, where thousands of supporters took to the streets. 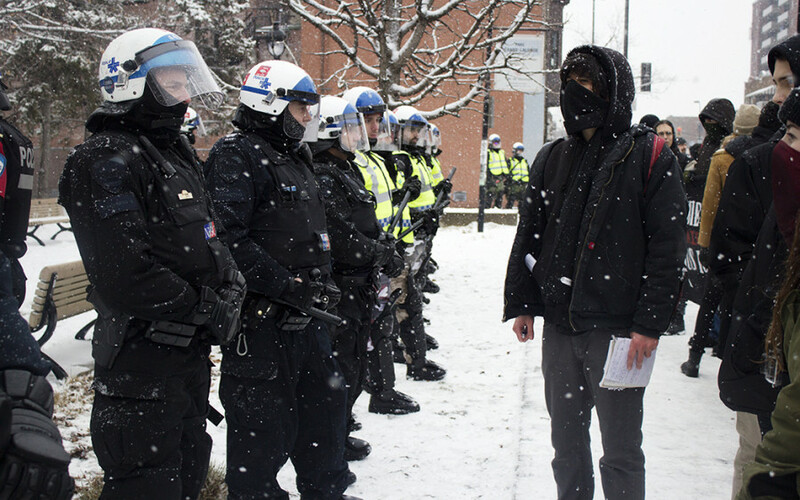 However, the group’s presence in Montreal was relatively muted, as only about 10 PEGIDA Québec demonstrators were visible. The larger group of counter-protesters were quick to respond when PEGIDA members were identified, with most counter-protesters rushing toward them and throwing snowballs in their direction. Roughly 50 police officers were on site—many in full riot gear—to separate the groups. Eye-witnesses said that one PEGIDA member was rushed away from the scene of the demonstration in a police van for his own protection. Jaggi Singh, the well-known Montreal activist who organized Saturday’s anti-PEGIDA protest, said that counter-demonstrations of this type are necessary to combat islamophobia and racism in Quebec. When a group of about six PEGIDA members gathered in front of Jarry metro, police were quick to block the intersection of Jarry Street and St. Denis Street, which separated protesters and media from the small gathering. After roughly 10 minutes, the intersection was reopened. The remaining counter-protesters gathered outside a nearby building where six police officers were seen guarding the lobby. According to eye-witnesses, two PEGIDA members were rushed inside by police as anti-PEGIDA demonstrators were trying to circumvent the police blockade. SPVM spokesperson Manuel Couture confirmed that one of the remaining counter-protesters was arrested on charges related to damaging a vehicle. This protester reached out to The Link and provided his version of events under the condition that his name not be published. 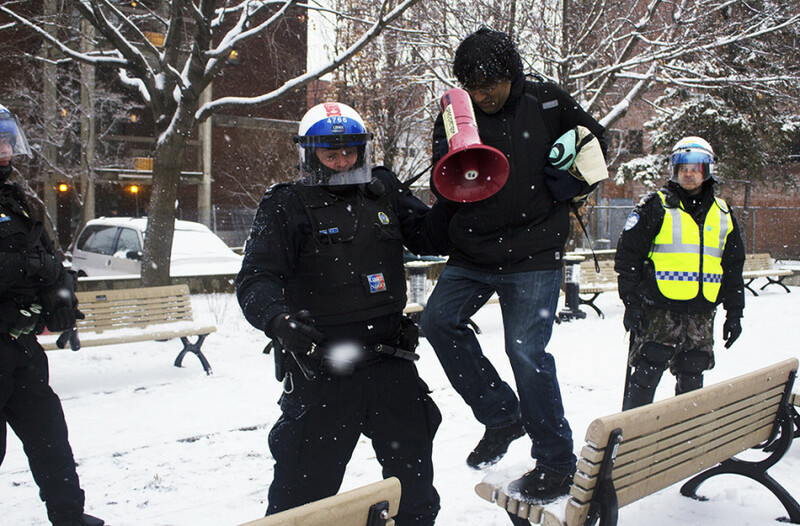 According to the activist, who identifies as a member of the group Anonymous Montreal, he and his fellow demonstrators were beginning to cross the street toward Jarry metro when he was singled out, arrested and had his hands zip-tied behind his back. The activist denied damaging a vehicle, and claimed that police targeted him because he was wearing a Guy Fawkes mask, which is a symbol of the online group Anonymous. Once arrested, he said he was placed in the back of a police vehicle and driven to a nearby parking lot, where he was eventually released and told that that he would need to appear in court. One of the officers told him that, as a condition of his release, the man could not be seen in the presence of his “comrades.” According to the Anonymous activist, the officer explained that if he were to meet up with fellow demonstrators in any way, it would be considered a grouping of more than three people, and therefore a protest and a breach of his conditions. According to Couture of the SPVM, no other arrests were made and no tickets were handed out under Montreal’s P-6 bylaw.